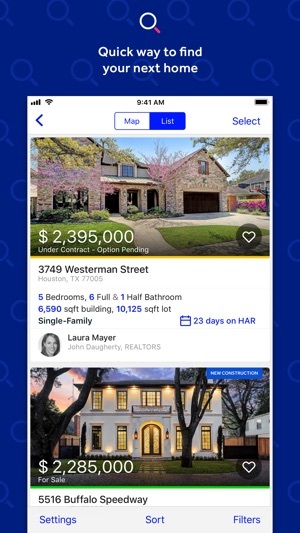 The HAR.com iPhone and iPad apps allow both consumers and HAR members to search for homes for sale or lease across the state of Texas. 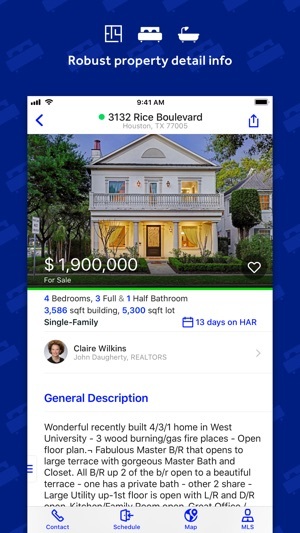 Consumers will be able to use the award-winning HAR.com residential property search engine to find the home of their dreams, bookmark listings and view property search history. Members can access up-to-the-minute MLS information (MLS subscribers only), their leads, listings, as well as access their company’s listing inventory. • Award-winning HAR.com residential property search engine to find Homes and Rentals across the state of Texas. 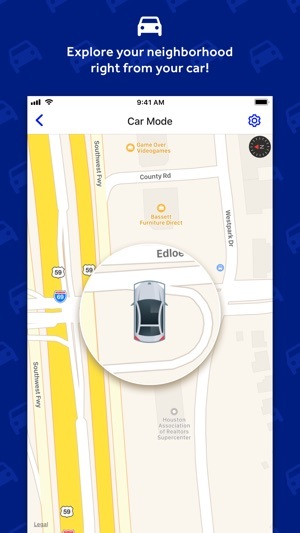 • Utilize the Drive Time search feature to locate home available for sale or rent within a designated commute time. • Filter search criteria by what’s important to you, including proximity, price, square footage and more. • Most comprehensive listing details include price, room dimensions, interior and exterior features, open house schedule and more. • Slide through an immersive photo gallery for each listing (includes up to 50 photos, which is more than you may find on any other app). • Enhanced mapping with Street View. 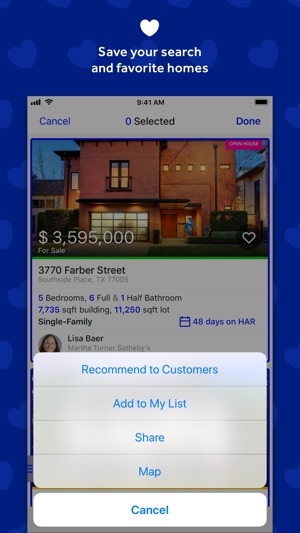 • Bookmark your favorite listings and easily share them with friends and family! • Save your search criteria and get an email when matching homes are posted on HAR.com! • Live chat feature to connect instantly with any agent about any property. • Information for more than 8 million properties in Texas, even those not currently listed for sale. HAR MLS subscribers may log in to the password-protected members only area by using their HAR.com username and password. Members have access to their leads, listings and their company’s listing inventory. • New Instant CMA feature lets agents create a Comparative Market Analysis report faster and more accurately than ever. If you have any comments or suggestions for improving the HAR mobile app, please email us at support@har.com. *Premium Content invitations must come from a REALTOR® who is an MLS Platinum subscriber. * Improved the similar listings feature to add list/map view modes. * Added new graphical lot information to listing details. * Improved the performance of the parcel lot lookup feature. We get better with your help. As we provide new product innovation, we depend on you to let us know how we're doing. Tell us what you like, or what you don’t, about our current revisions. We are always looking to improve, and it is feedback from our active and loyal users that helps us drive those improvements. If you had asked me before the update, I would have given us at five stars. Are use it daily and prefer it over other realty apps. However the latest update now groups properties into clusters. Maybe that works at Morrill setting but where I’m looking near downtown Houston, Clusters only make it more complicated, harder to spot changes, and harder to find what I want. That said, I do like the new features on the map that display comparables right next to the subject property. Cool new feature! You can disable the map clustering in your settings. If you need assistance in doing this, please feel free to contact us at support@har.com. 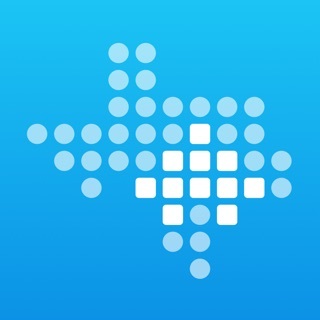 Houston needs a better app! Thank you for your feedback- this might have been when our website was down for a few hours on 4/27. Please try again and if you experience any further issues, don't hesitate to contact us at support@har.com. 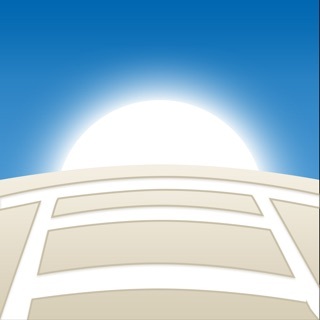 I use this app all the time as my family buys / sells property for remodeling. The new map cluster feature makes it nearly impossible. I used to be able to zoom to an area and see what I had already clicked on without all these extra clicks clicking on the clusters. Question for the developer- in what world do these clusters help anyone? It creates more chaos and user involvement. There are entire teams of people around the world figuring out how every user interface can be more automated and done with less clicks- why is hars new update so back in time? © 2011-2019 Houston Realtors® Information Service, Inc.